Starting this year we will be highlighting one client each quarter who exemplifies the qualities needed to allow Pilates to transform your body and share their journey at The Pilates Klinik. For our very first Client of the Quarter we chose Sharon Bammer who received a free pair of running bare tights and a running bare top! 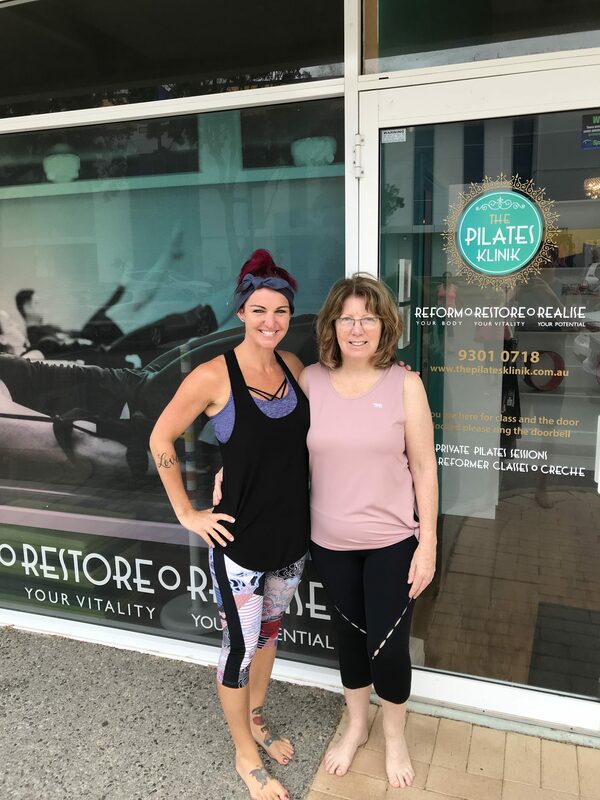 Read on to hear how Sharon came to find Reformer Pilates at The Pilates Klinik and how it has changed her life. Q : How did you get started with us? A: I first heard about the Pilates Klink through my sister Michele and her daughter who started coming. Then a day or so later I received a pamphlet in the mail, and decided to try for myself. I came in for a one on one lesson. I must admit, I wasn’t sure if I could do it that first time as I was quite unfit, but Michael was very patient with me and guided me through the lesson, so I decided to join the classes. Q: You recently joined our 100+ badass club by attending over 100 classes, how long have you been coming now? A: I have been coming for about 18 months and because the timetable is quite flexible, it is easy for me to find a class to come to and fit Pilates into my week. Q: We have 3 main instructors, how would you describe them? A: I have enjoyed classes with all 3 of the instructors. They are all very friendly and professional. When I take Kristen’s class I think of my early childhood ballet lessons as she has lovely posture and moves very gracefully, is always enthusiastic and smiling. Elena has a lovely Russian accent and is great in helping me get the most out of each movement. Michael is the cheeky one and seems to have energy to burn – he will make sure you’re always motivated! All three instructors are very good at describing and demonstrating each movement, i just enjoy the variety. Q: So why do you think you keep coming back? How has Pilates made life better? A: Pilates has made my life better because I feel a sense of accomplishment after I do each class. My body and mind are much stronger for it. I also enjoy the fact that even though you are in a class with other people, you are in your own space and concentrating and breathing through it yourself so it becomes my “me” time. It is also nice to see that there are people of all ages enjoying the class, their is a sense of community amongst the clients i like being apart of. Q: Many people worry they won’t be able to do classes but you have limitations and do fine, how does that work? A: I do scale some exercises down, due to bad knees and a left ankle that was broken a few years ago. I know my limitations with these old injuries and the instructors will often show me a modified version if I struggle with a movement, or sometimes I will do it at my own pace, which they often encourage people to do if they need to. Q: Pilates can be hard to describe to people who haven’t tried, what would you tell someone considering it? A: If anyone was thinking of taking up Pilates, I would strongly recommend it. After having tried various gyms and other forms of excercise over the years (after having to give up playing sport due to injuries), I have found Pilates to be the best form of exercise for me, it is not jarring on my body, but gives a good work out by stretching and releasing tension and building strength, I can definitely feel the improvement particularly in the core muscles and also my posture is much better for the lessons. Q: Do you see yourself joining the 500+ lifetime club someday?! A: I would like to think that pilates will be part of my life for the rest of my life, the benefits to both body and mind are very rewarding and I feel much better for doing it. If you see Sharon in the Studio please join us in congratulating her for 18 months of perseverance, consistency and effort to improve her health and wellbeing in leaps and bounds! Well done Sharon!